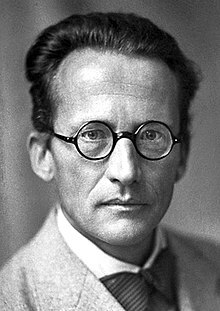 Erwin Rudolf Josef Alexander Schrödinger (/ˈʃroʊdɪŋər/; German: [ˈɛʁviːn ˈʃʁøːdɪŋɐ]; 12 August 1887 – 4 Januar 1961), a Nobel Prize-winnin Austrick pheesicist who developed a nummer o fundamental results in the field o quantum theory, which formed the basis o wave mechanics: he formulatit the wave equation (stationary an time-dependent Schrödinger equation) an revealed the identity o his development o the formalism an matrix mechanics. ↑ Moore, Walter J (29 May 1992). Schrödinger, life and thought. Cambridge University Press. pp. 10–. ISBN 978-0-521-43767-7. Retrieved 7 November 2011. This page wis last eeditit on 13 August 2018, at 05:13.